Objects, even the most mundane, hold stories. Stories of the owner, the buyer, the finder, the giver, the receiver, the carver, the painter, or the one who lost it or was forced to leave it. Our call to Mediașers, both current day residents and those with roots in Mediaș, was to consider an object, any object, which they or their family had brought with them to Mediaș or taken with them out of Mediaș, when they emigrated. 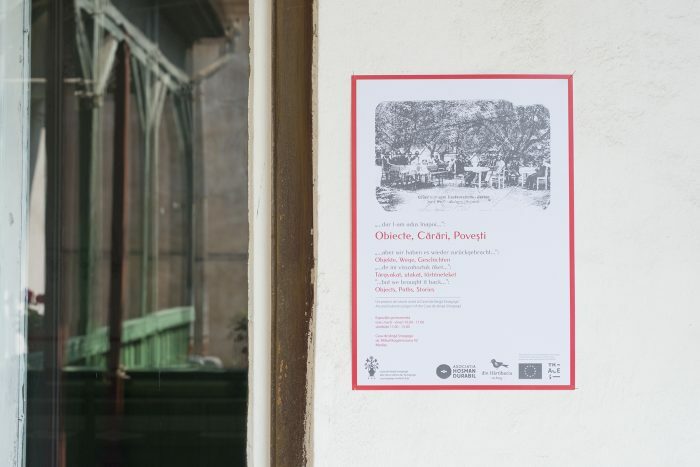 In this way we expected to collect stories – stories of families, journeys, people – all of whom were connected to Mediaș in some way. We chose to work with tangible objects knowing that “material things have the potential to invoke […] abstract concepts” such as love and loss. What we did not expect were certain over-lappings of stories that arose, the many common themes and parallels. Music or recordings played a significant role in many of the stories; time after time we exchanged notes on interviews and realized that again music was in some way one of the “objects”. Books and libraries were mentioned repeatedly. Grandparents and their stories were passed down and repeated to us by grandchildren. And movement – a constant moving to and fro, away and back, a coming and going – punctuates every story presented here. We collected more than just these eight stories. Choosing only eight to present was perhaps the most difficult aspect of the project because in the end, everyone’s story was fascinating: the Lutheran female pastor whose theology class was the first to ordain three women at once; the woman who composed a volume of poetry around objects left in her parents’ house following their death; the dentist from Cluj, with her grandfather’s wooden cross symbolizing life values; the man who still plays on the violin of his grandfather, who was a folk musician, playing for weddings, baptisms and other celebrations; the woman whose grandfather sent a letter written on a piece of bark from a prisoner-of-war camp. In her book Tangible Things: Making History through Objects, scholar Laurel Thatcher Ulrich reminds us that, “It is not just the things that matter. Rather, it is the people they allow us to remember, touch, and meet. Tangible things open doors to human feelings, emotions, and states of being that would otherwise disappear with their owners.” Ultimately, the project was not about things, but about capturing, recording and remembering these ephemeral sentiments, episodes, impressions. In the end, we selected stories that represent the historic diversity of the residents of Mediaș. Of course, it was very important to us to also include Jewish stories, in a place where the Jewish historical presence and role in the life of the town is otherwise so absent and invisible. These stories invoke the atmosphere of a different time and remind us of how things once were, when Margit Fein was known throughout the town for her mezzosoprano voice and asked by the Catholic church to sing, when Sarah Mindl Citron’s garden, in a courtyard off the main square, was blossoming and verdant. Finally, at the end of the exhibition we present several objects from our own spaces, items we selected from our archives and this house, where the community had its offices, held meetings and celebrated weddings, and various employees lived over the years. These objects have stories, too. Only we don’t know them. We encourage you to imagine what they might be. Singer Sveta Kundish (IL/UA) and accordionist Patrick Farrell (USA) bring together original and traditional Yiddish songs, Cantorial repertoire, and klezmer melodies in an unforgettable evening of new and old East-European Jewish music. This virtuosic and poetic Berlin-based duo presents emotional, thrilling and satisfying performances unlike any other in contemporary Yiddish music.